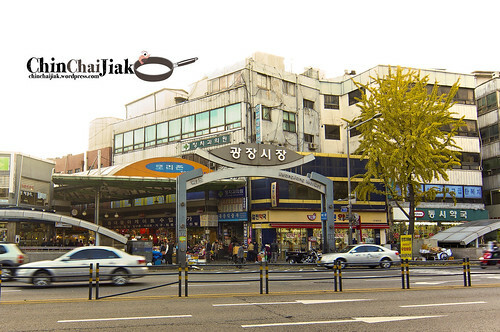 Gwangjang market was established in 1905, one of the oldest markets in not only Seoul, but the whole of South Korea. 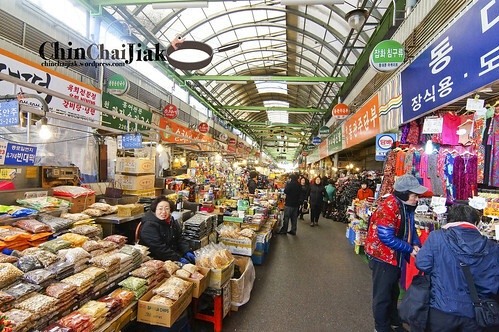 This multi-level market has about 5,000 shops and it’s a market that you can find everything, from snacks, traditional Korean food, bags, shoes, Kimchi, exotic seafood to the high-end silk, linen and the legendary Hanbok. Sampling of Kimchi. No plate, no toothpick, just hand. Point to the Kimchi to try and the lady will just place the kimchi in your hand. Right at the heart of this market lies the food section that is bursting with activity and loud noise. 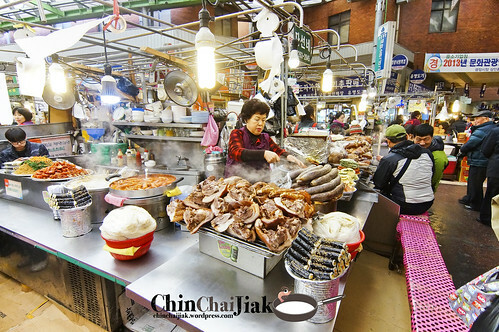 The steam-filled alley contains countless number of food stalls that offers a vast selections of Korean food like Japchae (당면 sesame oil noodle), Gimbap (김밥 rice roll), Sundae (순대 blood sausage roll), Jokbal (족발 braised pig trotter), Patjuk (팥죽 red bean porridge), and the very well known item in Gwangjang market – Bindaetteok (빈대떡 Mung bean pancake). 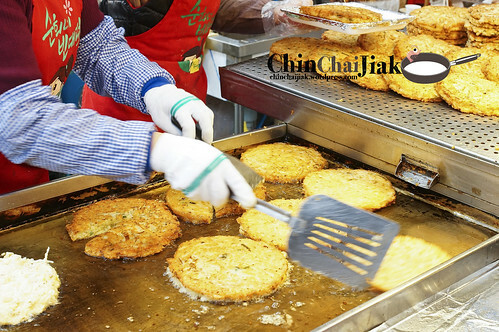 Among the food stalls, the one that stood out was those that are selling Bindaetteok, with stacks of towering golden-brown crispy pancakes that are freshly fried and served piping hot. Bindaetteok is made of grounded mung bean, with bean sprout, green onion, kimchi, and pepper. 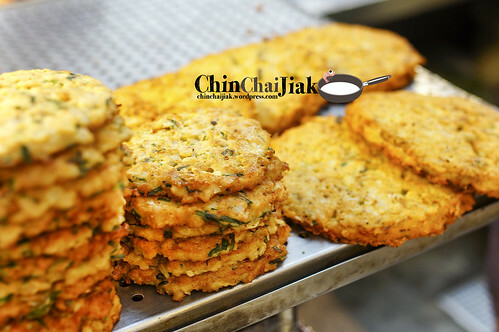 The mung beans are freshly grinned using a stone rotary grinder and the pancake paste is mixed and fried on the spot. After some observation, i patronized the stall that is most popular among the locals. Note that there is no restaurant treatment at these stalls and be prepared to sit shoulder-to-shoulder beside a total stranger for the meal. Paper cup and plain water is available and i don’t think that’s bottled water. Probably the stall owner refills them with boiled water. Among many stalls that are selling Bindaetteok, this is the one with the endless crowd. The stall number appears to be (61) 2263 – 7567. Keep a look out for this stall! I ordered the veggie version and the meat version, and both are reasonably priced at W$3,000 each. The veggie version is huge, with the diameter of a small pizza and the meat version, going at the same price, is evidently smaller. As a meat lover, there is no room for competition between the two as the meat pancake wins my favor. It don’t actually taste like a pancake but a giant piece of fried meat ball, only it’s a flattened version. 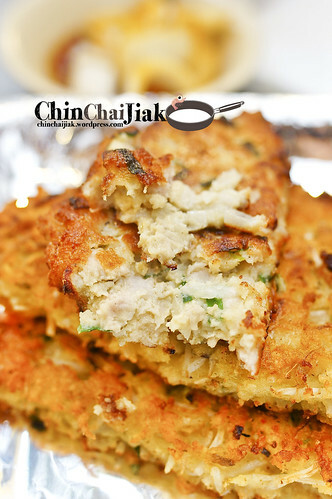 The savory minced meat patty is well marinated and flavored that is not excessively salty. I read that these pancakes are actually flavored using honey and this explains the tinge of sweetness. Hot & crispy exterior with a tender center. Best street food of the trip! 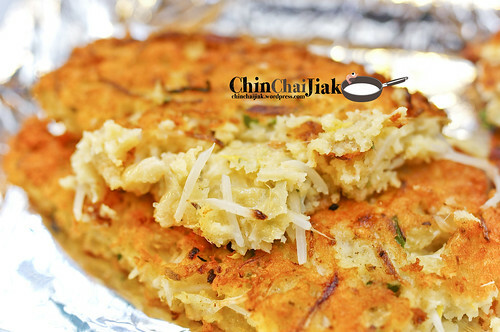 For the veggie version, it taste a little like our Singapore version of vegetable pancake (菜饼) that’s available in Singapore’s shopping centre, only the filling is fuller. I love the cripsy exterior and the texture is further enhanced by the crunchy bean sprout. 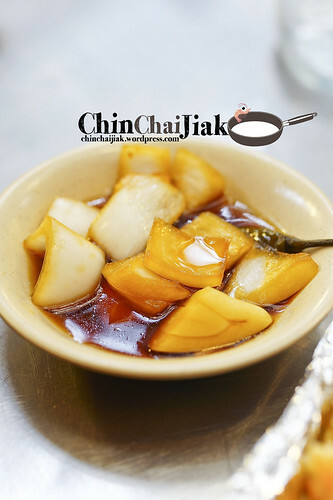 For those who find this veggie version a little plain in taste, grab a saucer and fill it up with their home-made dipping sauce that taste like a combination of rice vinegar, soy sauce, sesame oil, a little bit of chilli and slices of onion. Rest assure that after dipping in this sauce, you will finish the pancake in no time! The best part of visiting such a market is they have stalls that sells basically every kind of traditional Korean food. The blood sausage roll is highly recommended by the friendly Ajumma (middle-age auntie in Korean) as she kept pointing to the sausage although she can’t converse in English. I declined it politely after seeing the foreign lady beside me struggled to finish it. LOL. I know it’s not as scary as what i thought but i guess i am not very use to the idea of having a blood filled sausage rice roll after all. 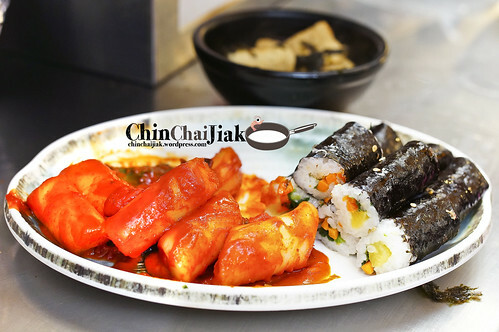 Gimbap is slightly different from the Japanese version of Maki as the Korean added sesame oil instead of vinegar into the rice. This non-luxury version only comes with pickle, cucumber and carrot which totally works for me. It gives a crunchy texture filled with the fragrance of sesame oil. The highlight of this Tteokbokki is for it’s sauce. I like it for the fact that it’s flavorful but not overly sweet and cloying unlike some Tteokbokki found in Singapore and this is much spicier than Singapore’s. Though I still prefer a thinner rice cake instead of a thick one like this. 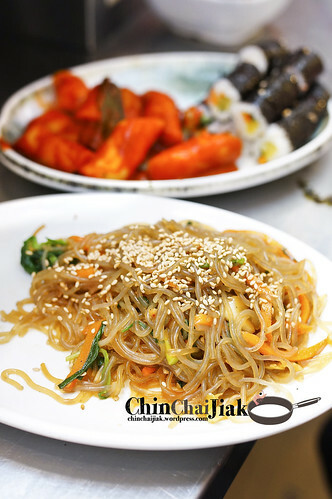 Japchae is definitely not anything new to anyone as it’s often served as a side dish in Korean restaurant. This japchae was served cold and it does taste like it’s stir-fried using instant chicken cubes, which is nice, but not exactly healthy to have it on a daily basis. I love the generous amount of sesame oil and sesame seed added to this simple and yet delightful dish. 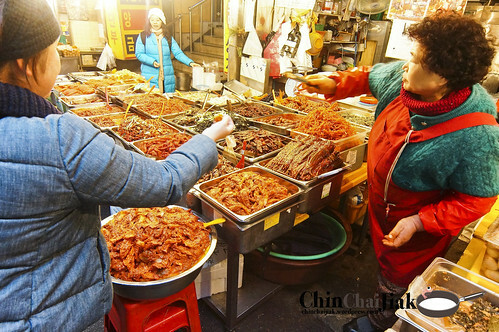 Eomukguk is the most popular street food during cold season! 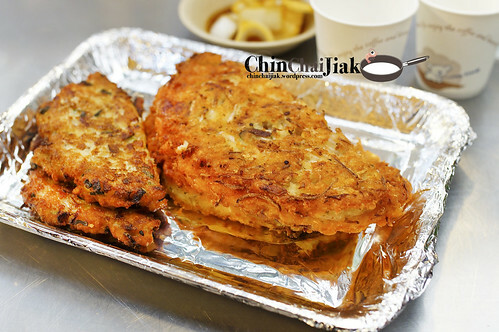 It literally means “fish cake soup” as the skewered fish cake comes with a cup/bowl of piping hot anchovy stock. All these dishes cost me W$11,000 which cost about an average of S$3.00 for each item. It’s slightly more pricey than what i expected. I have a feeling, just a feeling that i had been overcharged. Since i can’t really exactly communicate with the lady, i decided to just pay and forget about it. Since it’s not too much of a money, I don’t think there is a need to confront and haggle with the lady and spoil my day. Apart from the luxury malls, high-end shopping and five stars hotels, i thought it’s good to experience the unique culture of the nation and visit places that is unmistakeably Korean. And Gwangjang Market is one of such places in Seoul that provides an authentic Korean culture experience. 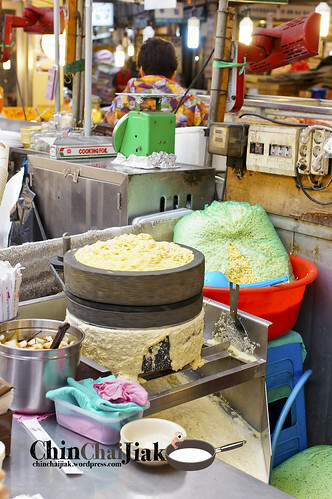 Apart from the food culture, there is so much more to see and experience at Gwangjang Market. As for food wise, if possible, ask for the price before committing to any purchase and if you are still comfortable with the price, go ahead. 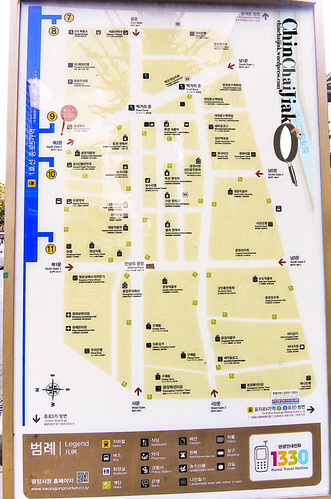 I took a photo of this map which gives a much clearer indication of the various alleys in Gwangjang Market and it even has labeling of the various zones in the market. 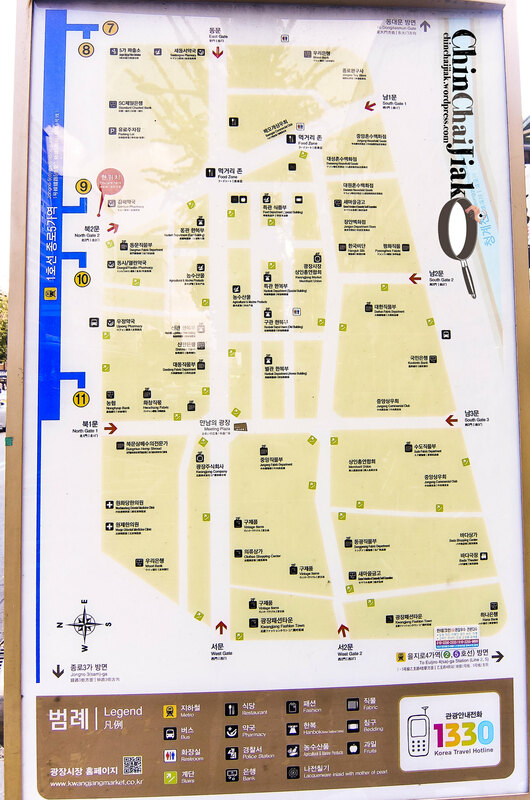 The nearest station to Gwangjang market is from Jongno 5(o)-ga Station and exit 7, 8, 9, 10 and 11 will lead you to the North and East Gate of the market. The market stretches all the way from Exit 7 to Exit 11 but the food zone is nearest to Exit 9. 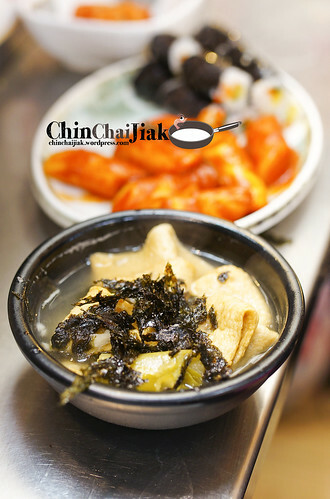 This entry was posted in Dishes - Bindaetteok, Dishes - Eomukguk, Dishes - Gimbap, Dishes - Japchae, Dishes - Tteokbokki, Good For - Casual Dining, Location - Dongdaemun, Type - Street Food, Type - Traditional Korean Food. Bookmark the permalink. Great photos and post! 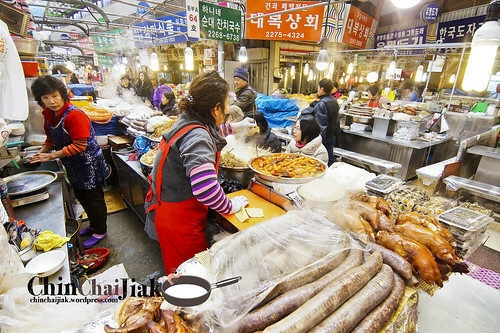 I have been to Seoul many times but haven’t yet made it to Gwangjang market. This is definitely going into my list for the next trip. 11k won for 4 dishes. Pingback: 10 Best Things to Do in Seoul! 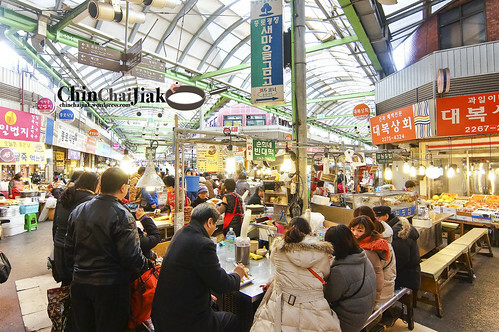 Pingback: 6 Best Foods to Eat at Gwangjang Market (Seoul)!